We are a reputed placement consultancy in Visakhapatnam (Andhra Pradesh), and also provide our Manpower Recruitment services to the valued clients. We offer reliable services to some of the most reputed organizations. 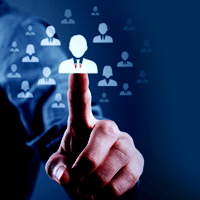 We provide the best career opportunities to candidates along with providing the best manpower to companies. We understand the manpower requirement of a particular organization and accordingly provide them, with the right candidates to the client organizations. Proper recruitment procedure is followed to select the candidates, to ensure they are best suitable according to the job requirement.